Winning the U.S. Open 9-Ball Championship is a highlight on any player's resume. It's among the most prestigious titles in the world and by far the most respected crown handed out on American soil. In the 128-player field, Cheng Yu-Hsuan's undefeated march to victory was bound to include a fair share of thrilling moments. This shot in the hot-seat match against Britain's Karl Boyes is among his best. Leading the match, 5-3, the Taiwanese powerhouse pocketed the first three balls after a dry break from Boyes. 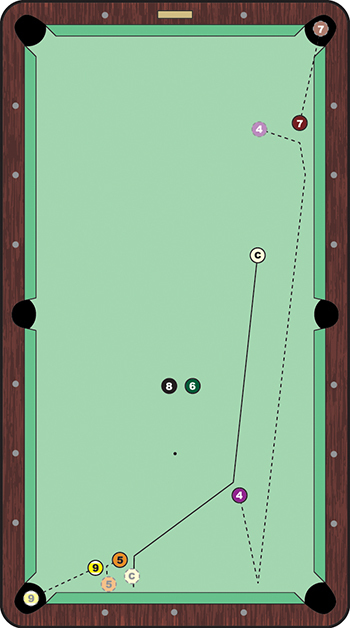 But working his way to position on the 4, he sent his cue ball on an unexpected detour after it clipped an object ball. With a backward angle on the 4 ball for the lower right corner, Cheng eyed the carom into the 5-9 that was lined up perfectly with the other bottom corner pocket. With a stroke slightly more than pocket speed, he sent the cue ball off the 4 and directly into the 5-9 cluster. The 9 dropped in the corner for a short-rack win built from necessity. Also, perhaps a case of being more lucky than good, Cheng sank the 7 ball in the top right corner, while the 6 and 8 ball blocked a clear path from the cue ball to the 4. Taking this 9 to go up 6-3, Cheng continued rolling through the match to take the hot-seat, 11-4. Boyes bounced back with a win over Liu Haitao in the left-side final, but the Brit had no better luck against Cheng in the final. The 27-year-old won, 13-6, becoming the first Taiwanese player to win the U.S. Open title in the event's 40-year history.